This zine was a long time coming, but we’re really proud of it! Yet to be scanned – sorry! We had a lot of fun making the cover of our fifth zine – it involved some leftover fabric paint, a couple of brushes and lots of blotting/flicking. The original copy is still somewhat sticky. bands to check out – part 2! We haven’t scanned our fourth zine yet, but we will at some point, promises. It tackles a whole host of issues, including fear of writing, the Suzanne Moore/Julie Burchill freedom of speech/transphobia debate, and discourses of sexual violence. It’s not all heavy going though, as there are also comics and memes shamelessly acquired from friends through the Internet. Our third zine predominantly explores ideas of “riot grrrl” – what does it mean today, and is it still relevant? We also reflect on Not Right after playing music together for over a year. Our second zine has a lot more hand-drawn/handwritten stuff than the first, which made it harder to turn into a PDF. It’s therefore a bit rough and ready, but we hope you’ll enjoy it anyway. 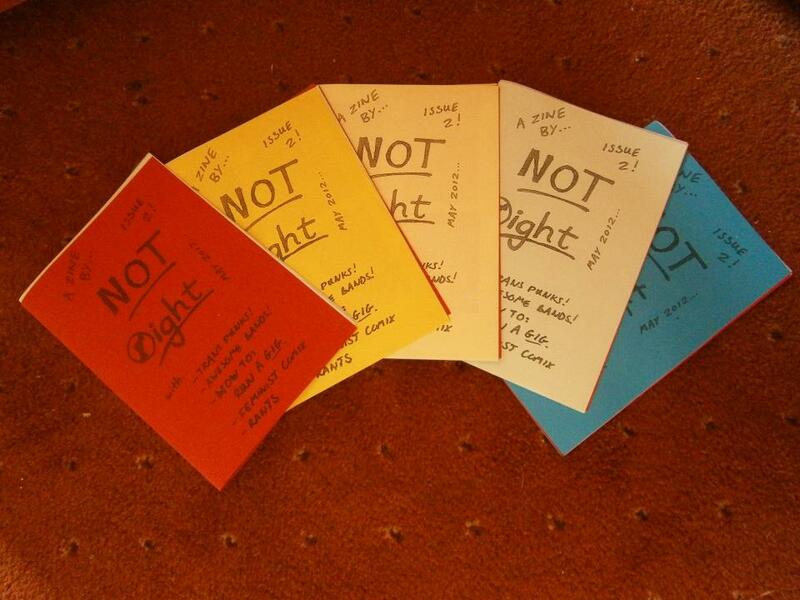 We made a zine, and then adapted it for the interwebs in an amateurish fashion. It doesn’t work quite as well as the original, but is still full of lovely writings.